Zeke's Landing operates one of the largest Jet Ski, pontoon boat and center console rental fleets in the boating paradise of Orange Beach and Gulf Shores, Alabama. Conveniently located in the heart of Orange Beach, Zeke's offers Yamaha WaveRunners as the Jet Ski of choice. 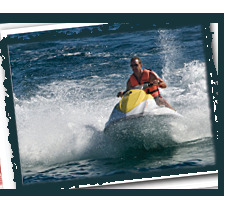 Zeke's Landing Marina and Jet Skis make the perfect combination for your spring break or summer fun in the sun! Pontoon and center console boat rentals at Zeke's Landing Marina provide a great way to get out on the water with a group. Relax with your family or friends and forget the hassle of trailering a boat. Cleanliness and reliability are hallmarks of Zeke's Boat Rentals. Zeke's friendly staff will be sure to cover all of the safety information with you and your group before you leave the dock. All of the necessary safety equipment will be provided. Renting with Zeke's is easy. Just call the number listed above, and one of Zeke's cheerful customer service representatives will have you on your way to your next personal watercraft or boating adventure!